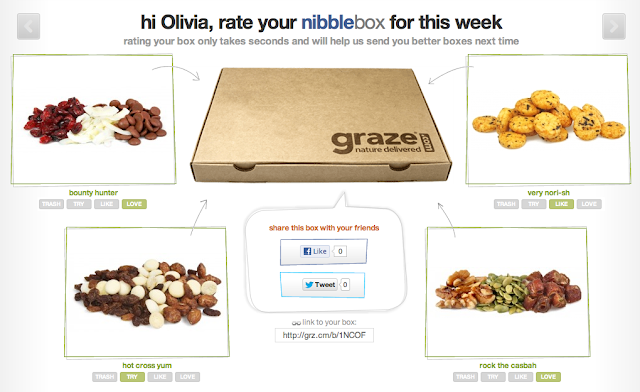 Remember how I went gaga over Graze the other day? Well, I am so excited to report that my first box came in the mail! As you can see above, they get you all excited for your mailperson to come by showing you what's in the package as soon as they send it out. Well, it was so delightful to come home on this snowy afternoon to a box in the mail just for me! I'm not going to lie, I immediately tore open the "Bounty Hunter" mix (cranberries, chocolate, coconut) and may or may not have devoured it in about 4 seconds (and the servings aren't tiny, lemme tell ya!). I also may have dug into the orange infused raisins, which are mouthwatering. I am so excited for next week's box! Sound like something you'd be interested in? Remember to use the code RJ9QWLN and you will get your first box for free!